Spider Traps that really work! The best spider pesticide is the pesticide you don't use... 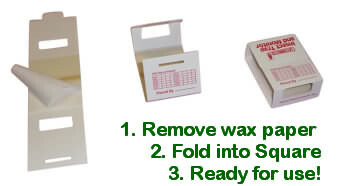 Choose Pesticide Free Spider Traps as an more effective spider control solution. Quality glue based spider traps have prevented spider bites in millions of homes. Spiders are drawn to the non-toxic bait that is INSIDE THE VERY STICKY GLUE. and any other crawling pest / insects! 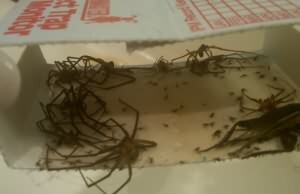 The best way to catch a spider is using Sticky Spider Glue Traps. No Poison means no worries about pets, family or food exposure. Catchmaster Spider Traps are proudly made in the USA in New York City - Not Imported! Check out the Spider Trap Guide. The most effective insect, cricket and spider trap you can buy! Get rid of your spider problem today. Spider Control does not need to involve pesticides! When you use a quality catchmaster spider trap there is no need for dangerous sprays or liquids because the spiders get stuck in the sticky traps glue that is pet and family safe. Don't take chances when dealing with brown recluse spiders! When you deal with the question "How to trap a spider?" you want to choose the best way to control spiders. Trap a spider with a sticky trap, and you can avoid the use of sprays or pesticides because a spider glue trap doesn't need those dangerous products. In fact, spider trap is the gold standard for spider control. Here's one of your Spider traps with lots of brown recluse spiders on it. We have plenty of them in the southeast. We don't risk poisons for us, our grandkids or pets.. Thanks for a non-toxic choice.